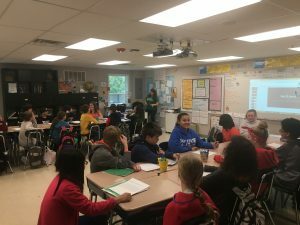 This week, sixth grade Humanities classes kicked off “Super Week” in preparation for their upcoming culminating event on June 8th. Scholars in the three different classes have been researching different shoe companies. Pictured here, scholars are collaborating with classmates from other teams to calibrate their shoe ratings. The final project for this expedition is a website titled If The Shoe Fits. You can help them with their data collection by completing this quick survey about your own purchasing habits.